Trons is a portfolio focus WordPress Theme. It provides responsive clean and minimal WordPress Theme for your creative portfolio web site. 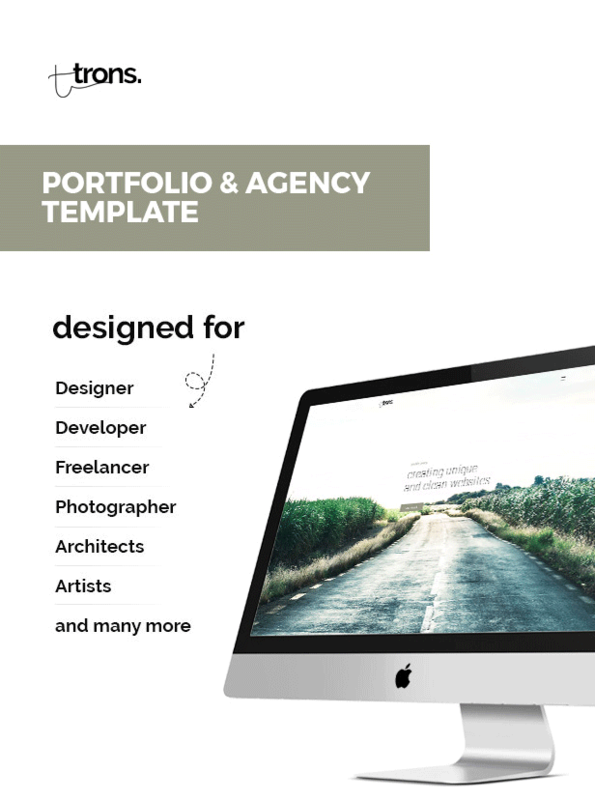 You can use this portfolio theme for: agency, personal portfolio, architect agency, photography studios, sound and music, musican, painter portfolio, artworks, art, artist portfolio, web design works, illustrators, trainer, projects, freelance designer. You can find this WordPress Theme suitable for their needs. The support takes a bit but it's worth the wait. Pego does a fine job of being patient and helping you obtain your goal. Thank you Pego. Great and simple theme to use, if you are looking strictly as it is shown in demo design. Great theme. Exactly what I was looking for to house my blog and podcast. Very extendable and media friendly. This theme is really clean and easy to customise. It is by far the most enjoyable experience in WP. The customer support also quickly helped me to customise the theme sending CSS when I needed. Highly recommended.